Hello everybody! As you may already know this year I'm participating in Me Made May'14.One thing I learned from this, is that my sewing is more on the practical side. Of course I love fancy skirt and dresses, but I prefer to be able to wear my handmade garments on a daily basis, and since I'm more of a jeans and tee type of gal I love sewing garments like this. Enter Tessuti's Mandy Boat Tee. A free, one-size slouchy tee pattern. I'm seriously in love with this pattern. Very easy to make and perfect for everyday wear. I love the fit and the endless possibilities this provides! I made mine in a black and blue striped knit that drapes beautifully. The pattern took about 1.5 m and come together in just a couple of hours! Instant gratification project or what? What's your sewing type? Are you more on the fancy or practical side? Beautiful! 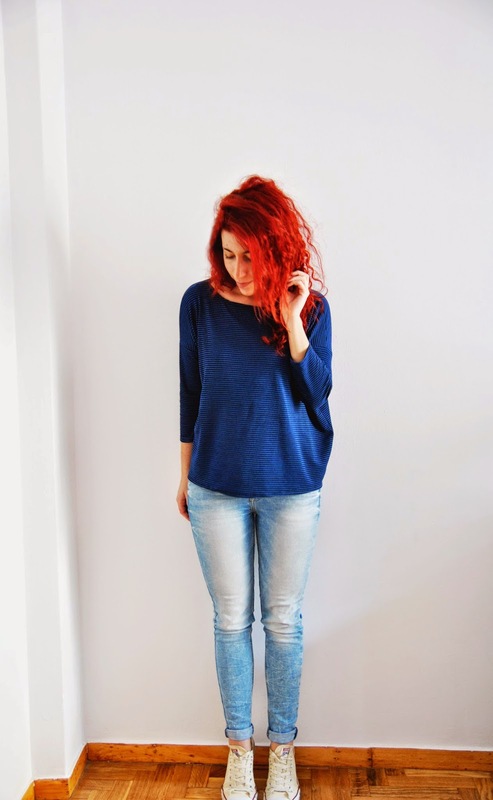 Love these pictures.I love these casual modern comfy stuff. Thank you!I do love tops like this too! They're just so easy and comfy to wear! Oh this is gorgeous. Will have to check this pattern out. Thank you! You should! This pattern is really great! This is really cute! I think I need to try it. I made the Hemlock tee, but it really didn't suit me at all... this might be a better choice! Love the blue and black together! Thank you! It was exactly the same with me! The Hemlock just wasn't my cup of tea! I'll totally recommend trying this one!